Six months ago when properly licensed Texans began openly carrying handguns, anti-gun activists and Second Amendment backers were sharply divided over what to expect. So far, gun owners seem to have the most complaints. When it became legal six months ago for properly licensed Texans to openly carry handguns, anti-gun activists and Second Amendment backers were sharply divided over what to expect. More people carrying visible guns would likely increase the chances of death or tragedy, opponents argued, while supporters said responsible gun owners would increase safety. The disagreement has not died down, and national attention was again focused on Texas gun laws after Thursday's shooting that left five police officers dead. Prominent policymakers, including President Barack Obama and Dallas Mayor Mike Rawlings, said open carry added to the confusion at the chaotic scene of the shooting as police had to consider whether people legally carrying guns might be threats. Dallas Police Chief David Brown seemed to echo that sentiment at a press conference Monday. Rawlings said that about 20 armed protestors — including one who police mistakenly named a suspect — became immediate targets of suspicion when bullets began to fly in Dallas. Many of them were taken into custody, questioned and released when it was determined they had nothing to do with the shooting. But the open carry of long rifles, which seems to have contributed the most to the confusion, has been legal in Texas for decades. Texas is one of the 44 states that allow the open carry of such guns. So far, officials say, the newly allowed open carry of handguns hasn't spawned any major incidents. In February 2015, as the Legislature considered making Texas the 45th state to allow the open carry of handguns, 75 percent of surveyed state police chiefs said they opposed the new law. 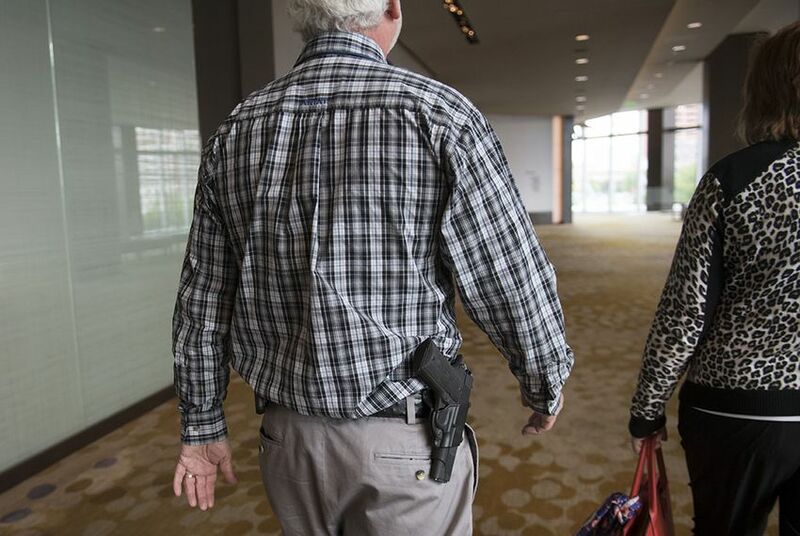 James McLaughlin, the executive director of Texas Police Chiefs Association, said that at the time his organization’s members worried that open carry might turn carriers into easier targets. But McLaughlin, too, said he had heard of no incidents in which the new law played a major factor. The Dallas shootings, however, rekindled arguments about revisiting the open carry laws, which state Rep. Diego Bernal, D-San Antonio, called "Republicans thumbing their nose at law enforcement." Rep. Larry Phillips, R-Sherman, who helped push open carry through the Legislature, said he and his colleagues did weigh the opinion of law enforcement. Despite the opposition from chiefs, rank-and-file members Phillips spoke to were generally receptive to the bill, he said. Bernal said he hoped to see a repeal of the open carry laws for both handguns and long rifles. Phillips said although the Dallas incident should be reviewed, it should be up to individuals to decide how to practice their Second Amendment rights safely. Much of the recent controversy over open carry has come not from gun opponents, but from gun rights activists claiming their legal rights to carry are being infringed. Saturday, for instance, Open Carry Texas, a state gun rights group, staged a rally to protest what it says are unlawful gun-prohibiting signs hung outside the Lamar County jail. About a dozen people attended the rally, which was scheduled more than a month ago. Gun rights advocates have filed dozens of complaints with the state over what they believe to be unfair restrictions on open carry in public places. Private businesses are allowed to restrict open carry in their establishments, and many have. The open carry disagreements echo earlier arguments over Texas gun laws. Bernal and fellow Democratic Rep. Chris Turner, D-Arlington, both said that they support the state’s concealed carry law — a law that faced similar police opposition as the recent open carry legislation when it passed in 1996. Lawrence added that he believes Texas gun policy remains far from settled.